New rules have come into force which mean cigarettes and tobacco must be sold in plain green packets and carry graphic health warnings. The rules, which also end the sale of packets of 10, are designed to deter young people from taking up the habit. Health groups have welcomed the measure, as the number of smokers in the UK continues to decline. But a smokers' group says the changes "infantilise" consumers and will make no difference to public health. 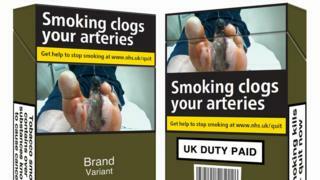 As part of efforts to "deglamorise" the image of smoking, the compulsory standardised green packaging must carry the new, larger, health warnings on two-thirds of the front and back of any packet. The greenish-brown colour has been described by some experts as "the ugliest colour in the world". No more "misleading" information, like "low tar" or "organic"
Similar restrictions will apply packets of rolling tobacco, while e-cigarettes are covered by separate regulations on packaging and warnings. There will also be a ban on flavoured cigarettes and tobacco. The measures were brought in last year, but retailers have been given time to get rid of old stock. Anti-smoking campaigners have welcomed the changes, with Hazel Cheeseman, from Action on Smoking and Health, saying that the packaging itself has been shown to be a "form of advertising", with the cigarette companies describing it as "their silent salesman". "Branding and advertising is one of the things that helps to recruit young people into smoking. "So removing the branding features, making the health warnings bigger and more prominent, is intended to protect young people from taking up smoking in the future," she said. Two-thirds of smokers start before they are 18, and Cancer Research UK also says that its evidence shows removing branding from cigarette packs will reduce their attractiveness to children. Forest, the smokers' rights group, says the new rules "treat adults like naughty children" and "infantilise consumers". "Adults and even teenagers are under no illusions about the health risks of smoking," says its director, Simon Clark. "Consumers don't need larger health warnings to tell them what they already know." Scotland was the first part of the UK to back the introduction of plain packaging of tobacco products. The country-wide move could lead to 300,000 fewer smokers in the UK over the next year, a major review has suggested.